Beautful luxury villa in central Croatia. The only one in this region with 5 stars. Located in Gospic, the largest city of one of Croatia's traditional and historic regions, Lika. It's in the close distance of national park lake Plitvice, which is the most visited, most popular national park in Croatia. Besides Plitvice, another national park you can hop in the car for is the great Mt. Velebit, along with national park Paklenica. The villa is completely surrounded by untouched and unspoiled nature and beauty, so if you're looking for a place for peace and relaxation, villas Joja is the place for you. The property consists of 3 separate units; Villa Bobo, Villa Niko and Villa Joja, each of them with over 100 sq.m. in size. Yet they are all connected by the heated path towards the swimming pool, giving the entire property over 300 sq.m. with the capacity of 23 beds. 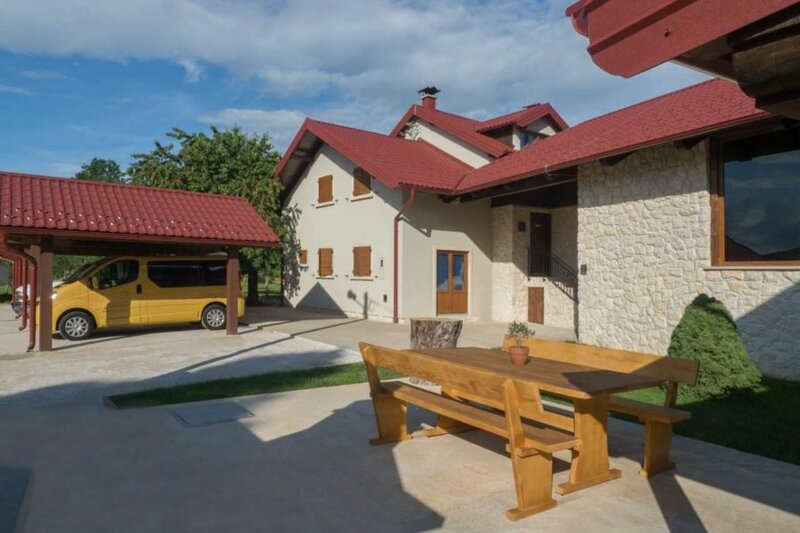 The villa is the only 5-star accommodation in the region of Lika, and it's built upon a few-centuries old family property. It has a beautiful view of the mountains and also a fruit and vegetable garden from which you can get your daily dose of vitamins. The spacious and air-conditioned layout will allow you to have comfort and personal space throughout your whole stay. Once you arrive you can start the barbeque and hop in the covered and heated swimming pool with a hydromassage function, enjoy a round or two of table tennis, start the outside fireplace for a maximum luxury of cosiness. Within your stay we will be happy to arrange a few trips for you. Perhaps you'd enjoy a nice vineyard with wine tasting, or a gastronomic excursion. The scent of sea, rock, sage, olive and bura (north wind on the coast) on one side and the scent of grass, hay, forests, fresh summers and sharp winters on the other. Whether you want to head to the beach in Zadar, or the party island Pag, to experience the Croatian version of the world-famous Ibiza during summer or visit a ski slope during the winter period. Perhaps you prefer more of nature and would like to visit national parks, maybe even 6 of them such as lake Plitvice, north Velebit, Paklenica, Krka, Una and Kornati. In case you are a history lover, we'll take you to see the birth place of Nikola Tesla and author Ante Starcevic, whom Croatian people call the Father of the Homeland. If you are more for actions, we got you covered: kayaking on still waters (Gacka and Lika), rafting on river Una, Zramanja. Quad safari on 3 different locations, ziplines, paintball, rock climbing, hiking, trekking and so much more can be easily arranged with one of our luxury vans.